Most silicone keyboards have one big weakness: Oil. 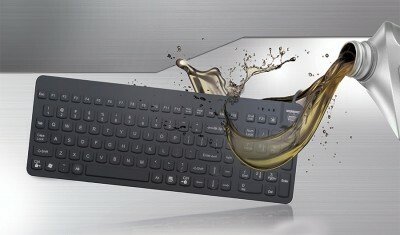 If your crew works with substances like oil or grease, then an oil-resistant Man & Machine keyboard is a great solution. 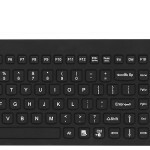 Our engineers created a special additive to make these keyboards perfect for machine shops, automotive repair facilities and other places where greasy hands are common. Don’t be fooled by its soft texture; Silicone is one of the toughest compounds around. It’s perfect for extreme temperatures and rugged environments. Our waterproof keyboards are seamless with no cracks, crevices or exposed moving parts, preventing dust, dirt or grime from getting inside. Our uni-body top was designed to minimize moving parts and ensure reliability in the dirtiest areas. Washing is a breeze with standard industrial cleaners or soap and water. And because the letters are laser etched, they will never rub off or become hard to read. In the rugged environment water, fluids, dust and dirt has a way of clogging up sensitive computer and industrial systems. Fortunately, you can select premium, fully sealed computer keyboards and mice from Man & Machine. IP 64 and IP 68 compliant, and USB compatible, they work on Windows, MAC and Linux systems. These peripherals come with a plethora of features that enable them to meet the rugged requirements of the industrial workplace. 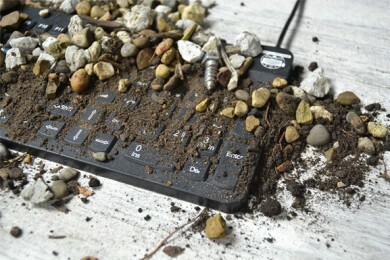 Stop replacing keyboards and mice that become covered in grease, dust and metal filings. Invest in a Man & Machine keyboard that can take a beating in your busy shop.